Always hot-cut your ripstop. It’s easier and stronger. You’ll need a surface to cut on: cardboard will do nicely. the only thing you’ll have to watch is that it’s covered with white paper (overhere it’s called Duplex ) the reason for this is that the paper layer contains chalk, which deminishes the sticking of the ripstop to the cardboard when hot cutting. A thickness of 3 mm is ideal. I use a (Weller) soldering gun for cutting. They are not to expensive and tips are easily replacable. I always make my own tips: easy to do and you get the perfect shape. 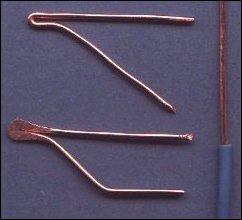 I make them from copper wire : bend it as shown in the picture and flatten the tip. Every now and then give it a knife’s edge with a small file. It cuts cleanly, fast and precise. Be sure to get at least a 20 % model: it means it can be working for 20% of the time without overheating. Also cardboard: 2 - 3 mm thickness. When using the flattened tip you don’t have to worry about burning up the sides. You won’t. If you need to draw the seam allowance on the ripstop there is no need to make two templates: just cut out the template without the allowance and when cutting place the tip of the cutting tool in the center of a thick metal washer and let it slide along side the template. It takes some experimenting to find the right size washer, but if you want a line to sew on and a perfect seam allowance it's worth the trouble. The cheapest and best rulers are the simple alu strips they sell in DIY shops. If you have to cut longer than 1 m look for a ruler that’s used for cutting carpet: thin steel, about 5 cm wide. The sewing machine is the probably the most discussed item. My advice: never buy one of those new electronic fancy stitch machines. They don’t have the quality of the oldies, and you’ll end up paying for stiches you don’t need. Straight and zig-zag is all you really need allthough a 3-times over (two steps forward one step back) elastic stitch is real handy for parts that endure a lot of strain. If the word goes round in the family that you want to take up sewing there is a big chance there is someone who has some machine sitting in the attic that you can have for free. - make sure the layers stay where they are: some machines stretch the upper layer. Easily detectable if you stich two equally long stripes together; when finished the ends must meet exactly. - make sure the ripstop is held down enough so that it does not slip when working. - related to that: ensure the stitches are equally long. - see if it will do one stich at a time. - if you have the choice, pick the machine that has the longest arm. - see if the settings are correct: sew with a different color for under and upper thread and watch if the “knot” is in the fabric and see if the stitches are tight without crumbling up the fabric. Last but not least: only buy it if you have the feeling that it defenately is: YOUR MACHINE Remember: you can be very critical: there are a LOT of second hand machines on the market that have been rarely used and in very good condition. If you have the room for it a special table is something to consider. Again, it does not have to be anything fancy. The idea is to take an old table, about 1 - 1.20 wide, and to make a hole in it on the right side and fit the machine in the hole so that the machine and the table are one working surface. If you place the machine about 20 cm from the front and on the right side of the table you have a perfect working area: the kite to be lies flat in front of the needle and is much easier to manipulate. It will defenitely make sewing a lot easier. If you don't have room for that luxury you can also make a U shaped extension board as in the above image that rests on the table and fits around the machine. It will defenately make sewing alot easier. You should check the tension regularely. Most problems sewing ripstop come from the fact that it's so thin: with "normal" cloth you wouldn't notice. Be sure the upper and lower tensions are correct: start with the bobbin. Put the bobbin in it's case and let it dangle from the thread: it just has to hold position. but you give a little tug it has to slide down a bit. Adjust the little tensioning screw on the bobbin until it does. Having done this, insert it in your machine, and start sewing. The easiest way to see if it works right is to use a different colored thread on top. The "knots" should be IN the fabric. If you used two colors, the bottom color should not show loops at the top and vice versa. Also be sure you have a needle that's big enough to allow the thread to slide through easily. ( I use at least a 90-100 needle with 60 thread) Don't use fancy needles: a standard sharp pointed one is ok.